IN ORDER to reconcile the wartime 1944 photograph with the postwar "eye-witness testimony" of smoke billowing from Crematorium building chimneys, the historians and scholars of the Simon Wiesenthal Center have helpfully inserted smoke into the photograph, thereby avoiding injurious puzzlement among school children and other innocent visitors to its Website who might otherwise fall foul of the lies of the Revisionists. We recall that when the US Government finally released the air photographs of Auschwitz in 1978, historians and scholars of the Central Intelligence Agency first inserted captions identifying buildings as "gas chambers", etc. ; even the National Archives dissociated itself from that attempt at forgery. 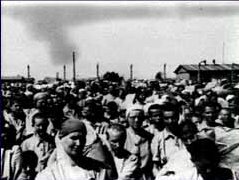 IN 1999 the Simon Wiesenthal Center published on its website a photograph (below right) with this caption: "As these prisoners were being processed for slave labor, many of their friends and families were being gassed and burned in the ovens in the crematoria. The smoke can be seen in the background. June 1944". By Friday, May 5, 2000 the caption has been surreptitiously and guiltily changed to: "As these prisoners were being processed for slave labor, many of their friends and families were being gassed and burned in the ovens in the crematoria." The fake smoke was however still in the photo. . .
Update (as of Sunday, December 3, 2000): Caught red-handed in their forgery, the SWC has removed the fake smoke from the photograph at the above link. When checked on Monday, August 11, 2003 the photograph had been wholly removed, and replaced with the words "Photo not available." Well it was, (and still is below), but it was a fake, wasn't it? We have archived the page (click image, left), in case the Center decides that admitting the fakery was a bad idea. ON ONE Internet thread can be seen the Wiesenthal Center's mendacious reply upon being challenged about the infamous photo. It reads, "Thank you for your inquiry. The photo was never retouched. A smudge on the photo was incorrectly identified as smoke from the chimneys." The "smudge" conveniently belches forth from the top of a distant chimney, however. We wonder how many people in history have been hanged because of "incorrectly identified" smudges? 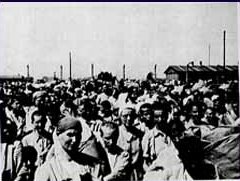 The unretouched photo showing May 1944 new camp arrivals at Auschwitz. From Auschwitz Album 1978 (1st edition, Beate Klarsfeld Foundation, New York, 1978), photo No. 165. Suddenly there is distant smoke in the background behind the fence-posts, poles and new arrivals. http://motlc.wiesenthal.org/albums/palbum/p00/a0007p2.html 2/3 down the page, click on thumbnail photo: "Hungarian arrivals after the "Selektion" at "Auschwitz"
Our thanks to photo expert John Ball for drawing our attention to this forgery. See David Irving's essay on photo forgeries (in German). We originally wrote: "We wonder how long the SWC will leave the evidence of their faking on their Website. Please notify us the moment it vanishes!" People did.